A few weeks ago, I hinted that I had a BIG life change in the works. Well, now I can tell you the BIG news: I got a new job! After 3 years at my former job I was ready for something new, different, and less stressful. This new job is all of that, less hours, and more money! I'll have more time to enjoy living in Hawaii, try to get a tan, and cook and blog, of course! 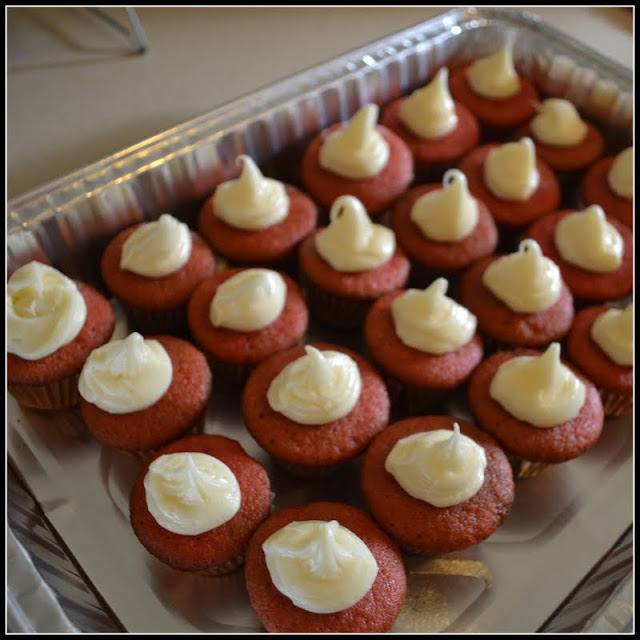 To celebrate my BIG life change, I decided to make mini red velvet cupcakes! At the risk of sounding like a broken record, let me tell you that I don't like baking. Baking makes me feel frustrated, incapable, and defeated. I'm immediately flustered and panic at the slightest hiccups while attempting to bake in the kitchen. Baking only happens because my sweet tooth demands it! For example, before making this recipe I opened the (very high) cabinet that contains all the baking ammunition - sugar, flour, baking soda, baking powder, food coloring, etc. I pulled the things I needed down and put them on the counter. These items were not placed neatly in one area upon being removed from the cabinet, they were all over the place. I found a bag of sugar that contained less than a single cup of the small, sweet substance, and I needed 2 1/4 cups. I went ballistic! It was past 8 pm and the next day was my very last day at my job, I needed to have homemade cupcakes. End.Of.Story. Now in a state of major panic and self-pity, I begged Bryce to go get sugar for me. He was comfortably lounging on the couch and looked at me like I was asking him to part the Red Sea. So, I took my pity party to the car, then to the grocery store for more sugar. I ended up also buying pre-made cream cheese frosting so that I'd be able get to bed at a reasonable hour. I returned home with a forced positive attitude, I had everything I needed and was ready! Back into the kitchen I went with the sugar and frosting in hand. That's when I saw the HUGE bag of sugar sitting on the counter. >>Sigh<< I was so eager to panic that I didn't look around to see that I, in a moment of prior wisdom had acquired, had a back-up sugar! If you need sugar you now know who to ask. I started making my I-got-a-new-job-but-I'll-feed-you-one-last-time cupcakes for the office around 9 pm, using a Red Velvet Cupcake recipe from Better Homes & Gardens. Preheat oven to 350F. Line mini cupcake pans with paper liners. 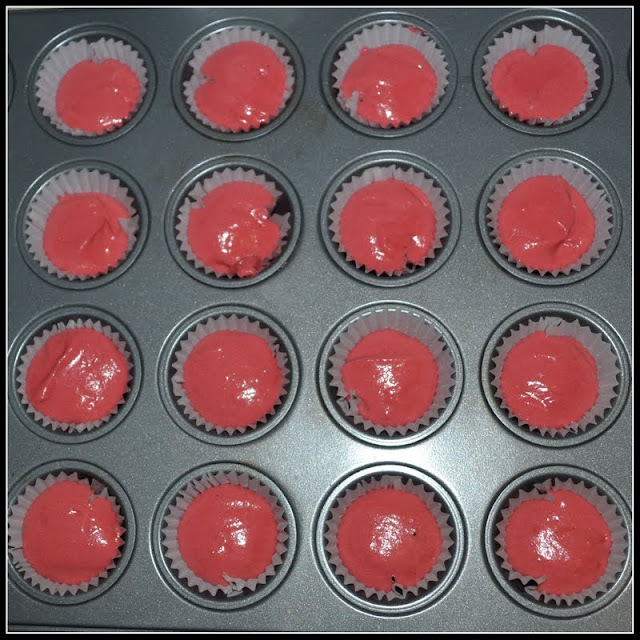 My apologies, I don' t know how many cupcakes this recipe makes. I made 24 minis and a small cake! 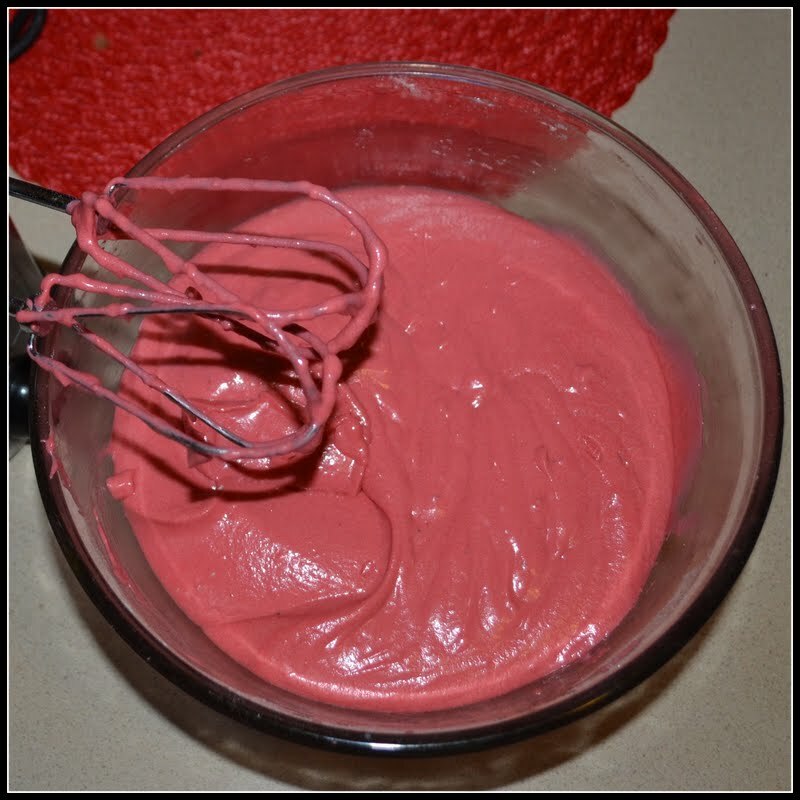 Combine flour, cocoa powder, and 3/4 teaspoon salt in a medium bowl. Hey... salt wasn't on the ingredient list! I'll add it. In another bowl, beat butter for 30-seconds on med-high. Add sugar and vanilla and beat until combined. Add eggs, one at a time, beating batter after each. 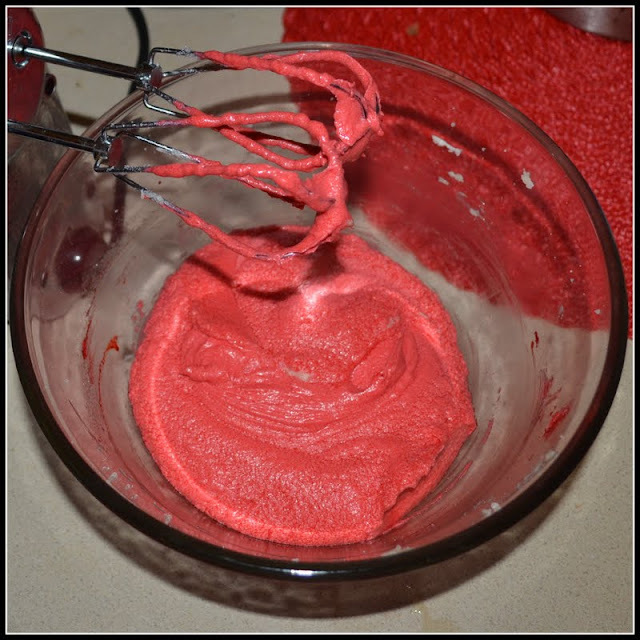 Add the food coloring and beat on low to combine. Side note on the food coloring - I was shocked when I found out that red velvet cake is red because of dye. Anyone else? It almost takes away all the fun, until you realize it's cuter than your average cake, delicious, and still contains chocolate! My red food coloring wasn't completely full so my "red" velvet was more of a reddish-pink velvet. Next, add flour mixture and buttermilk - alternately - to the egg mixture, combining on medium-low after each addition. In the smallest bowl you own, stir together baking soda and vinegar, then add that to the batter and beat until just combined. See - mine is pink! Spoon, scoop, or pour the batter into the mini-cupcake papers, filling about 2/3 full. This photo demonstrates how awful I am at making each cupcake equal in size. Bake for 15 to 17 minutes. I swear that each cupcake is a totally different size! Cool on a wire rack for 5 minutes, then remove from pans and cool completely. I put the cream cheese icing into a ziploc bag and plopped a tiny bit of icing on each. The icing distribution is almost as inconsistent as the cupcakes! They still managed to be cute, despite my lack of equality. The cupcakes and I ventured to our last day in the office (first and last day for them). Needless to say, they were much more well-liked than I was! Just kidding. Everyone is just upset because they're going to miss me, right? After 3 years with my very first "big girl job", I hope I left lasting impression filled with memories of hard work and a positive attitude. If I didn't, I hope they remember me by these adorable sweet treats! Wow these look amazing! Congrats again on your new life as a state worker! Your photography is improving too. You are now hired as my race photographer. That's it, I'm buying you frosting tips and bags. 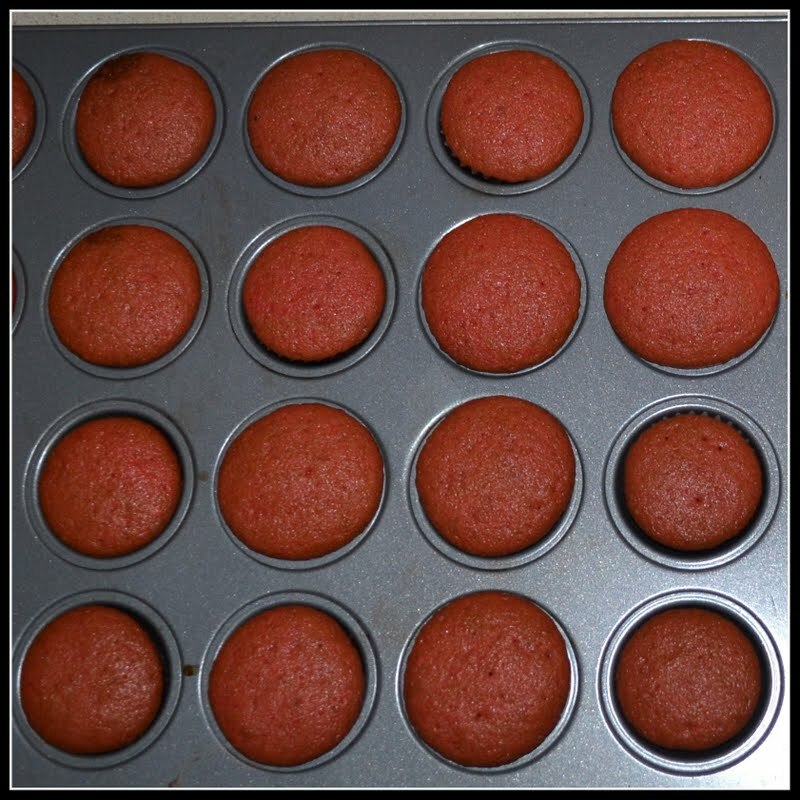 I am very pleased to see that you acquired a mini cupcake pan; something *I* consider an essential in any baking pan arsenal. Bravo on the cupcakes! Deanna - thanks :) I'd be happy to be your race photographer! Darren has fancy cameras that I can borrow, although how can I hold a Cricut sign and take photos?! LOL. Brookie - Nooooooooooooo! 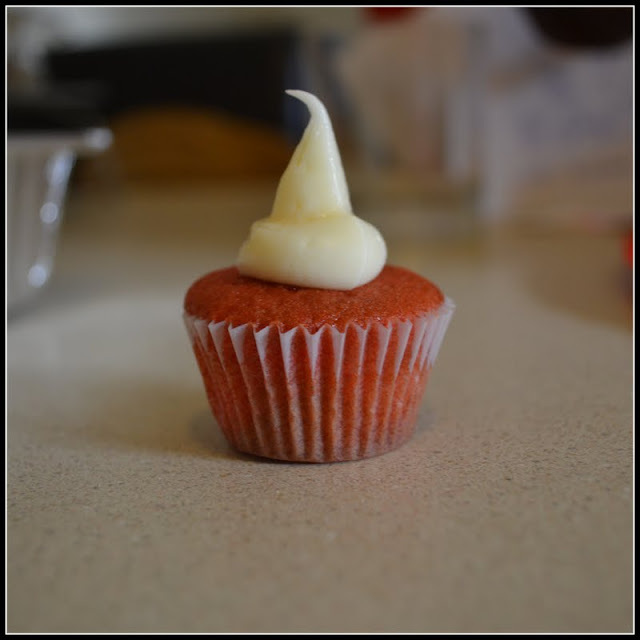 I hate frosting things, I was going to put that in the blog but thought it'd be too whiney. "I hate baking, I hate frosting, blah blah blah!" I do love the mini-ness!